It is no secret, the better we eat the better we feel. When living with any type of medical condition, eating well becomes even more important. Sometimes it is hard to find healthy meals that are also delicious and easy to make. 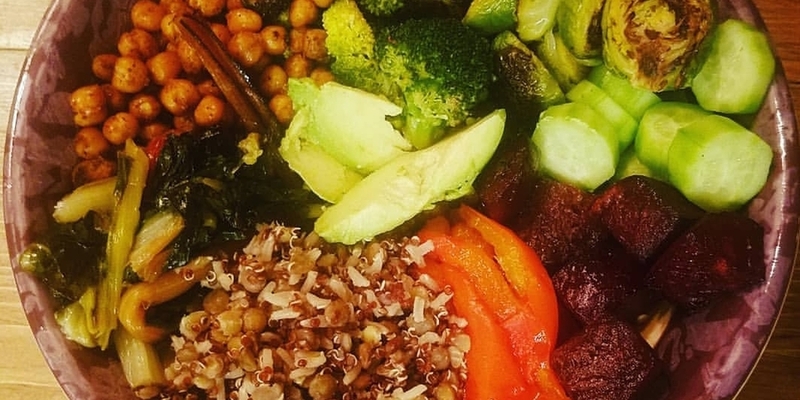 Enter the Buddha bowl - .a hearty, filling dish made of various greens, raw or roasted veggies, beans and healthy grains. They’re easy to make, super health and delicious. So packed full of goodness that they have a rounded “belly” appearance on the top like the belly of a Buddha. What I love most about the Buddha bowl, is that you are free to use your creativity, specific tastes and preferences, to create a customised meal. You can pick as many ingredients as you like. For quick week night meals you can opt for just a few ingredients or whatever you have on hand. Cooking is a wonderful outlet for creativity, as well as a fantastic opportunity to develop fine motor skills – for children or adults. With the Buddha Bowl, you are doing a good amount of peeling, chopping, slicing, and tossing, so it is great for work on fine motor skills. If short on time, or energy, you can always use pre-cut veggies in the grocery store. Pick colourful veggies and you will end up with a work of art that is as beautiful as it is delicious and healthy. It is healthy: Consisting of roasted, sautéed, or raw vegetables, and grains, you end up with a meal packed with vitamins and nutrition. It is colourful: Pick the most colorful vegetables you can find to fill up your bowl. Make it a work of art. It works fine motor skills: Since this bowl is filled with many types of different vegetables, you will be working those fine motor skills while chopping, peeling, and slicing. A little taste of different foods: Getting a little taste of a lot of different foods is fun. You also get a variety of different vitamins and nutrition in one meal. Creativity: You can use your creativity to come up with any combination of your favorites. Easy to make: Once you have selected and prepared your veggies, toss them in your choice of oil (avocado or olive oil work great) sprinkle with sea salt, roast, sauté, or serve raw. Add in your choice of grain such as brown rice, lentils, or quinoa, and you have yourself a full meal. Kids will love it: Being able to customise the vegetables your kids like is a plus. Kids also tend to try new things when they are colourful. Whenever possible, opt for veggies such as: purple carrots, tri-color green beans, rainbow Swiss chard, beets, etc. Family activity: Have the kids join in the preparation. Investing in a set of child safe plastic knives is one of the best ways to get kids involved in the kitchen. They are free to cut, slice and chop veggies without the worry of getting hurt. The Buddha bowl has its place in all seasons. In the warmer months, fresh vegetables will be readily available and in abundance, making it a great choice to use home or local grown produce. In the colder months, it becomes a little more difficult to have vegetables readily available. We therefore, tend to forget to incorporate vitamin packed vegetables into our diets. By adding the Buddha Bowl to your meal rotation in the colder months, you ensure that you are eating well all year-round. To give you an idea of where to start, here is what I used in my latest Buddha bowl. The vegetables were then arranged in the bowl along with a whole grain blend of brown rice, quinoa, and lentils. You can choose to top with any type of dressing, such as balsamic, or tahini. I found that it did not need anything additional. Again, it is all your preference. No matter what you decide, simply have fun creating this delicious and healthy meal in an all encompassing cooking activity. Check out CPA Youth and Lifestyle Supports for more ideas on health and cooking. Or contact us to speak to a client services consultant. Why not share a recipe on our online community?